Be brief: Your statement should be between 300-500 words. That’s about three minutes when read aloud at your natural pace. 2. An introduction to you. Who are you? Where do you live? What do you do? 3. Your Belief Statement. Explain what your belief means. 4. A Quotation - Explain how your quotation relates to your topic. 1. Choose 4 of the values below. 2. In 4 separate blocks, write down as many items as you can associate with these values: words, experiences, people, stories for each word. The more the better. 2. Click on “Browse Essays” and find 3 essays that deal with your value. Some will have aired on NPR, others will not. 4. For one of the essays, write a summary (100 words or less) also on the GRADE 10 BLOG. ______ Police are your friends. ______ What goes around comes around. ______ How you act in a crisis shows who you really are. ______ People learn from their mistakes. ______ You can’t depend on anyone else; you can only depend on yourself. ______ If you smile long enough, you become happy. ______ There is one special person for everyone. ______ Money can’t buy happiness. ______ Doing what’s right means obeying the law. 2. On the weebly blog, tell a story that either shows the belief in action or explains why you believes what you do. On the Blog, include the belief statement and a story. 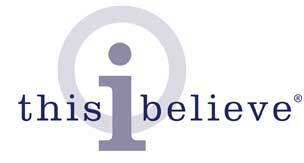 In class, we will listen and examine some sample "This I Believe" essays. 1. download the response chart here. 2. Go to http://www.thisibelieve.org/index.php Look at the column on the left. A. Clicking on “Essays on NPR” will get you text and audio for many essays. You can read blurbs before you choose. B. Clicking on “Browse Essays” will allow you to choose essays by theme. Some will have aired on NPR, others will not. C. Clicking on “Advanced Essay Search” will allow you to narrow your search by age, theme, etc. 3. Choose at least two from “Essays on NPR” so you can both read and listen. Clicking on the links below will take you directly to the essays. You'll have access to text and audio. 4. In your group, you will complete the response chart for one essay following the example given. 5. By yourself, complete the response chart for another essay. event/inciting incident, rising action, climax, falling action, resolution. essential to our understanding of the book. definition, the page number, the sentence you found it in the book and a picture to go with it. man's shirt on page 12." 8. Book Quiz - Write 20 multiple choice questions that cover the entire book. For your Literature Circle book each week, each group will complete a Power Point for 10 vocabulary words in your book. The Power Point will follow the same format as the one we did before. For more information check the Wardlandia Wikispace. Each week, one member of your group will write a Weebly post on a website or article that links the events, characters, ideas, themes in your Literature Circle Book to the real world. 1. A LINK to the website or article. 3. An explanation of no less than 200 words on how it relates to your book. You should complete your reading and finish your role sheets the night before the date of Literature Circle. Students who are seen doing their role sheets the day of the meeting will receive a zero for the day. I'm very serious about this.